Thanks to Google, inquiring minds are able to find information about cannabis quicker than ever before. Over the last decade, cannabis has become more and more accepted among all age groups and cultures. Gone are the days of stigmatizing users as lazy stoners. A new generation of acceptance is upon us, thanks in large part to the vast amount of information made available on the internet. Inquiring minds can simply enter a search term into any browser and quickly be presented with an endless stream of reasons why cannabis is not only a great alternative medicine but also a safer adult recreational product than alcohol. On a day-to-day basis, Google has become one of the most important tools we use for figuring out everything, from what to have for dinner to where to get the cheapest oil change. Every day Google process more than 3.5 billion searches, that’s 1.2 trillion per year! Google analytics keeps track of everything that’s being searched and complies comprehensive lists of trending topics, common words, and familiar phrases. In recent years, “cannabis” and “weed” have been continuing to show a steady increase in the number of times the terms are searched. 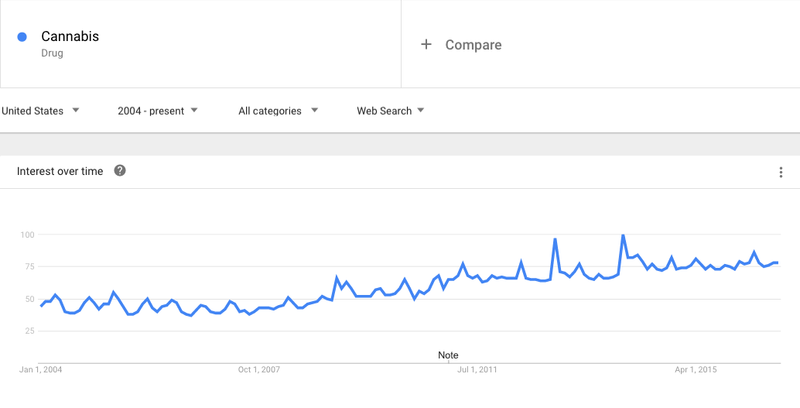 According to Google Trends, people searching for information about “weed” has risen 75% since 2004. While this might seem like an abnormally large time frame, 12 years, it really shows how far the cannabis movement has progressed over that period of time. Prior to 2004, and the real beginning of the idea of legalizing cannabis in any form, many people still chose to believe the false propaganda from the Reefer Madness era. As new information has become available people are actually taking the time to learn and research on their own, no longer believing or trusting government information and false scare tactics. With so much information available, and more people seeking it out than ever, it would make sense that the number of adults who admit to using cannabis is also growing. A new study conducted by Lancet shows that, in the United States, admitted usage has grown from 10.4% to 13.3% between 2002 and 2014. More astounding is the amount of people who believe that moderate cannabis use poses no serious risks. When previously asked, just 6% said they believed cannabis use was safe or without risk. Now, 16% say they believe periodic cannabis use causes no harm. 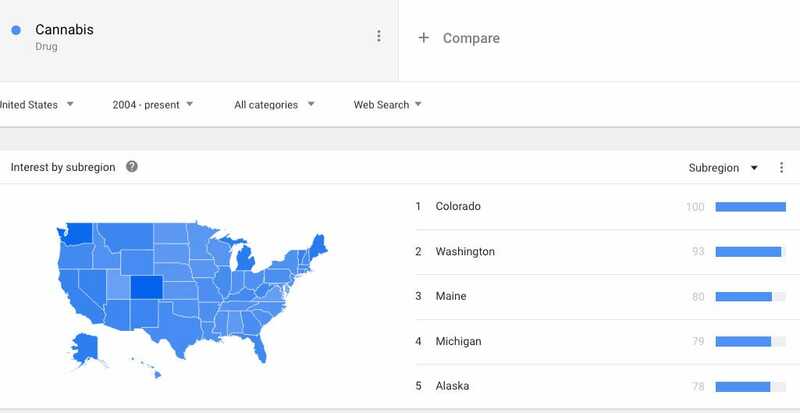 Colorado residents have shown the most interest in searching out information about cannabis, probably because so many of them are eager to be informed about the highest grossing tax market in their state. Likewise, becoming the first state to legalize recreational use likely sprouted many questions for uninformed citizens. A new legal form of recreational intoxicant is likely to spark the inquisitive minds of any Colorado resident. As many states prepare to vote in November on the issue of legalizing cannabis, either for recreational or medical use, it’s likely we’ll continue to see this rising trend in Google searches. While all states who will see cannabis on the ballot this year are expected to pass legalization with flying colors, according to recent polls, it is thanks in large part to the information those voters are able to access through search engines like Google.